I have a a LOT of people ask me what they should buy for their favorite foodie this year. 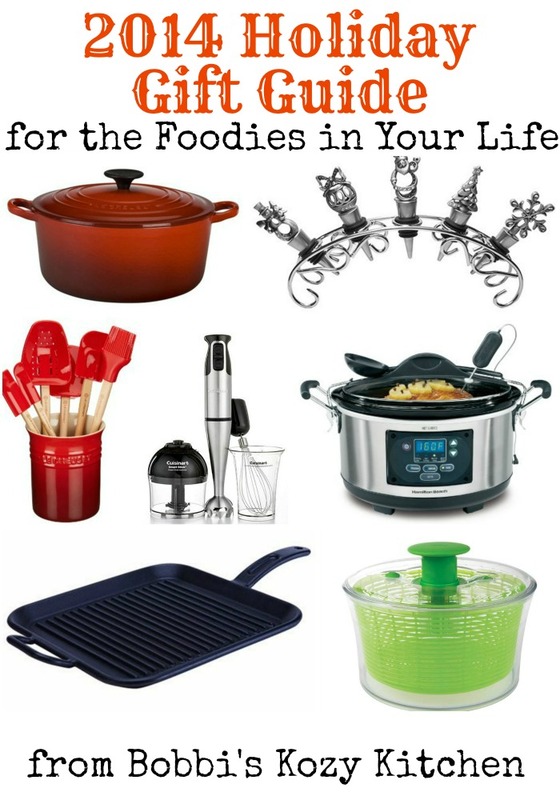 So I decided to put together a list of my favorite kitchen gear. I own all of the following items and use them all of the time. I honestly couldn't live (OK that is dramatic)....cook, without them. I bought a Le Creucet 5-1/2-Quart Round French (Dutch) Oven years ago and have been in love with it ever since. It is my go-to soup pot and works perfect for braising roasts and chickens. I have had mine for 8 years and it is just like brand new! I have several other Le Creucet pieces on my wish list this year so if you have an in with Santa, send him to my Pinterest!! If you told me years ago that I would be one of those people that said "I can't live without my cast iron skillet" I would have laughed. When I lived in the south everyone raved about them and cooked just about everything in them. I was a non-stick kinda girl then and thought they were all crazy. Now? Oh there really isn't anything that can compete with the sear you get in a cast iron skillet, or the perfection of grilling indoors on a cast iron grill pan! Just like my Le Creuset pot, this Cuisinart immersion blender is a must have in my kitchen. I am a soup junkie and this terrific little tool makes blending creamy soups soooooo easy. No more burning my self, or making a huge mess transfering soup to a blender. Just grab the immersion blender and buzzzzzzzzz it to creamy goodness!! Pair it with the Good Housekeeping Blend It! : 150 Sensational Recipes to Make in Your Blender cookbook. This year my slow cooker has already been getting quite the workout! I love nothing more that being able to set it and forget it. Then I am off to get a million other things done. Even though there is only two of us, I love making full recipes so I can freeze some for later meals. It makes using my slow cooker a win/win all the way around. We are getting this for one of our son's and his girlfriend for Christmas sshhhhh don't tell! Pair it with the Fix-It and Forget-It Big Cookbook: 1400 Best Slow Cooker Recipes! What can I say about this salad spinner? It is a life saver!! I use so many greens and before I got this I had issues with wilting and *gag* sliminess even though I would wash and dry them as best I could. Once this salad spinner came into my life? I could give a relaxed sigh of relief because I was no longer wasting my herbs and greens! Pair it with the Salad of the Day: 365 Recipes for Every Day of the Year and The Herbal Kitchen: Cooking with Fragrance and Flavor. Now that I have begun to bake a LOT more, I discovered Silpat baking mats and OhhhEmmmGeeee where have they been all of my life? No sticking, no mess.....aahhhh I can relax and bake. I love it...and them!! They are a must have if you do ANY baking! Pair them with Betty Crocker The Big Book of Cookies and Better Homes and Gardens Baking: More than 350 Recipes Plus Tips and Techniques cookbooks. Cutting boards are such an essential piece of kitchen equipment and this 3 piece cutting board set is all I need. Several sizes to choose from, and the ability to have more than one cutting station as I cook? Makes my life so much easier. Plus these bad boys are super sturdy, the will last forever! Do you have a wine lover to buy for this Christmas? My kids know how much I love wine AND Christmas, so they bought me these Holiday Wine Bottle Stoppers. Soooo ding dang cute. I love them! Keeps any leftover wine from going bad. If you prefer a non-holiday style you can grab a set of these for your wino errrr wine lover. Another thing I have had for several years, this set of mixing bowls. I love the rubber bottom because it keeps clumsy my from sliding the bowl all over the counter (or off the counter completely), plus they are dishwasher safe. 8 years later, they are still good as new! Another Le Creuset item that I absolutely adore is this Silicone 7-Piece Utensil Set. I can't tell you how many rubber spatulas I went through before I got this set. I am not a hand washing kinda girl, so they would dry out, crack, and break. Plus my sauce brush...well it was a hairy mess BLEK! Now that I have this set I am baking, BBQing, and scooping away! I ❤ it! Well, I hope I have been helpful in your quest to find the perfect gift for the foodie in your life. I can guarantee they would be happy with any of these wonderful products. Oh, and remember to tell Santa to check out my wish list on Pinterest OK?